"He Did IT ~ Flutie Did IT ~ It's OVER> 777 ) - God's Earth Party Forever site. Doug Flutie 'uncorks' The "Hail Mary" pass of the last century. Welcome One & All to a Doug Flutie Appreciation page. People are still talking about this moment. 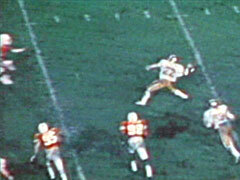 Do you remember where you were when this epic Boston College ~ U of Miami 'Battle of the College Titans.' took place? Thank you Chris Menn for sharing on YT. Thank you 805Bruin for sharing on YT. Fact for inquiring minds... paul considers himself an alum of the U of Miami. College ended for us there w the Kent State massacre. There was no going back after that. Thank you NFL Films for sharing on YT. Thank You Doug Flutie & All who helped create this documentary. Thank you sXxSlenderMotoxX_2 for sharing on YT. Thank You Doug Flutie & all who contributed to this documentary. The "Hail Mary" Pass ~ Forever immortalized on campus of Boston College.